they only live 12 - 15 yo and he is in good health is this a sign that he is just being a cranky ol man? I wouldn't be surprised at his age if he's experiencing arthritis which could be one reason he's snappy. If that's the case glucosamine really helps. My 2 girls are just shy of 10 years old now and they've been getting glucosamine supplements daily for about 2 years or longer now. It's definitely time for a senior checkup. Have your vet give him the once over to see whats going on with your big guy and to offer suggestions on what he may be experiencing and also for things to look for as he continues to age. 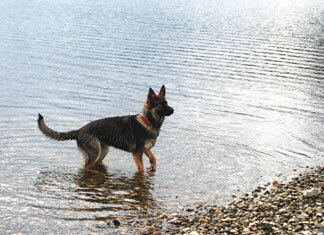 For more info on senior German Shepherds please read on. Good luck with your boy.